Shrimp Paste (gkabi): This concentrated product of finely ground fermented shrimps in sea salt has an even more compelling smell than its companion, fish sauce. There are vastly varying qualities, the odor differing accordingly. Many are undeniably foul-smelling, but there are a few brands that actually have a pleasant, albeit very powerful, roasted shrimp aroma. Many Westerners have unknowingly purchased gkapi because of its benign name, "shrimp paste," only to discover its true nature. Not having the faintest idea of what it is supposed to be like, some have tried to return the product, complaining to the store that it has rotted and spoiled. Like fish sauce, gkapi is rich in protein and B vitamins. It is an essential ingredient in making chilli pastes and curry pastes. Just about every curry paste has a dab or two of gkapi in it. When pounded and blended in with an array of aromatic herbs and spices, its powerful smell dissipates and actually makes the entire concoction very fragrant. When cooked into food, a little bit of this concentrated paste adds a whole lot of delicious shrimp flavor. A favorite use for gkapi among Thai people is as the primary ingredient in a very pungent dipping sauce for raw or lightly blanched vegetables and fried fish, called nahm prik gkapi. Wrapped in a banana leaf and roasted over hot coals, it is then pounded in a mortar with chillies and garlic, followed by the addition of lime juice, fish sauce and sugar to constitute an intensely hot, shrimpy and limy sauce. Other ingredients may be added to make other nahm prik (chilli dipping sauces), such as tiny, bitter pea-eggplants; fried dried shrimp; cooked and chopped fresh shrimp; young green peppercorns; sour tamarind and roasted maengdah, a roachlike insect with a most unusual fragrance. Nahm prik sauces are definitely for hard-core Thai food lovers only. Gkapi is packaged in small plastic containers or glass jars and is labeled as "shrimp paste." The only ingredients listed are shrimp and salt. The color varies from a pinkish or purplish grey to a dark greyish brown. The consistency also varies, from soft and pasty to dry and hard, depending on how long the fermented shrimp was allowed to dry in the sun. Most brands cover the top with a layer of wax to seal in freshness. Remove this waxy layer before using. Once opened, refrigerate the paste to keep it fresh-tasting, for although salty, it can change color over time and become even more concentrated. Refrigerated, it keeps indefinitely. Always cook gkapi before consumption. Because different batches vary in saltiness and shrimpiness, make adjustments as necessary in recipes that call for it. 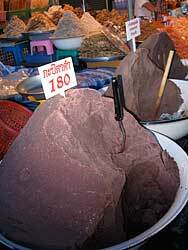 When you visit Thailand, take note of the big mounds of brown-and-grayish matter filling large metal bowls in the fresh marketplaces. As you walk by, you will unmistakably identify it as gkapi. A choice of types and grades in differing shades and unit prices are sold by weight to satisfy different users' needs. The bustling markets and roadside stalls in the seacoast towns of Rayong, Hua Hin, Petchburi, Chaiya and Trang sell enormous quantities of their very fresh, high-quality and very fragrant gkapi daily to Thai tourists who frequently make stops to buy foodstuffs to take home. I myself bring a couple of large containers of the best gkapi back to America each year. It Rains Fishes & Dancing Shrimp. All rights reserved.